Gable Farm shed fully enclosed or when open on one side is also known as a Machinery Shed. 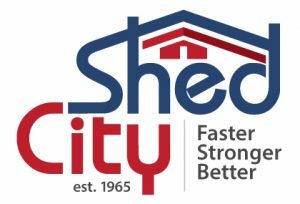 Shed City have products that will give you space for vehicles, boats, caravans, farm equipment, horse floats and heavy earth moving machinery and the like, as well as ample room for storage of household belongings, tools and equipment. THE FRAME IS THE BACKBONE OF A STEEL BUILDING. At Shed City Pty Ltd we use superior techniques in the design and manufacture of our steel building frames, providing a bolt-together design which can be assembled quickly without the need of specialized skills. Each frame is comprised of two (clear span) or more columns / uprights supporting rafters across the width of the building Engineer designed to have one gable end open or one side open or both. This provides Shed designs with layouts that suit you and the versatility you require on your property.